Brief Synopsis – A young idealistic lawyer is hired by a mysterious law firm with dark secrets. My Take on it – I am a HUGE fan of John Grisham’s novel and especially enjoyed his first few books. 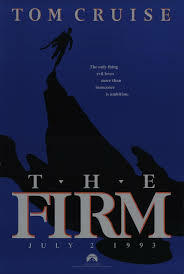 The Firm was actually the first one of his books that I had the pleasure to read and that was in 1992. I loved it from cover to cover because it was so thrilling and exciting. I recall the feeling I had when they announced that the film would star Tom Cruise and Gene Hackman and saw it on opening weekend. Unfortunately, I was very disappointed by the end product since they did a poor job adapting this novel for the screen. I have avoided rewatching this film in nearly 25 years due to that. I recently decided to reread all of Grisham’s novels and read them in chronological order. Having finished rereading the book earlier this week, I immediately decided to rewatch this film in order to have a fresh comparison in mind. Once again, the film was a disappointing experience since they make too many changes to the storyline which actually are detrimental to the momentum of the story. No adaptation can be perfect, but this one diverges too much from some of the thrilling and interesting ideas displayed in the book. Cruise is ok in the lead role, but I think it might have been more effective had they chosen a lesser known actor to play the role. Hackman on the other hand really shines here in the role of Avery Tolar despite the fact that they aged his character by about two decades in the conversion of the story to film. This film is more than 2 and a half hours long and after having read the novel, this feels too short because they leave out too many of the important and interesting plot points that make the book such an attention grabber the whole time. The music is amazing here and that remains the most memorable aspect of this film no matter how you look at it. Bottom Line – Not as thrilling as the book and the changes to the story actually hurt the momentum of the story. Cruise is fine as the main character but had they cast someone else in the lead, it might have worked much better. Hackman was a great choice for the role of Tolar despite being twenty years older than the character is meant to be. The music is the most memorable thing about this film. This film is 2.5 hours long yet it still feels quite incomplete for anyone who may have read the novel it is based on because too many important plot points are either changed or excised from the finished product.